what’s on your bucket list of shots? I have an ever-expanding bucket list of photographs that I would like to take in my lifetime. I think having such a list goes hand in hand with seeing opportunities to photograph. I always carry my camera with me just in case a shot presents itself but I also love those times when I can carve out some time just to go find my shot. 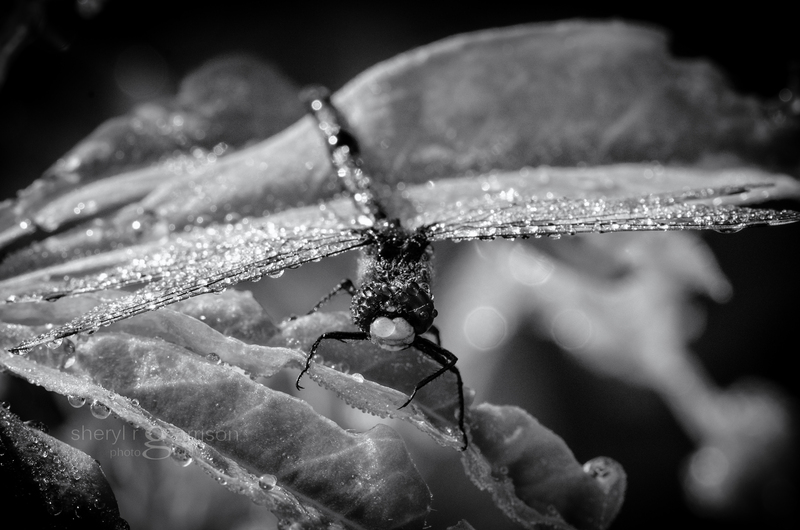 Years ago I saw some breathtaking photographs of dew covered insects and ever since then have been on a search to find a dew laden dragonfly. On this morning I opened the door to let my dog out and saw a sparkly dew covered world. Tiny droplets clinging to every surface it seemed… would today be the day? Pulling on a pair of Boggs and screwing on my macro lens I headed out to my pasture in search of insects and hopefully, just maybe, a dragonfly? It’s not like I haven’t done this before, I have searched high and low for the dragonfly with no success but often the hunt can be just as fun. I wondered what the neighbors would think if they saw me crouched in the wet grasses peering intently at every strand; getting colder and more damp by the minute! And then I saw it…amidst the lupines, sparkling like a little jeweled ornament, covered from his eyes to his wings in tiny droplets. Taking care not to disturb him I gently pushed some leaves out-of-the-way to photograph him and then replaced them afterwards. They are quite vulnerable in this condition, unable to fly until their wings dry and I checked back from time to time to watch the progress until he finally flew away. Getting a chance at a shot that you’ve been searching for is exhilarating but as is human nature I just want to do it again! I would love to hear in a comment what’s on your bucket list of shots and in the meantime I’m going out to watch for a heron in flight carrying a twig for his nest! I’ll be interested to hear what you come up with! What a jewel laden dragonfly! My wish is to have my camera with me when I see something wonderful to capture on film. You’re getting better all the time with that! You willed that shot into being, Sheryl! Fantastic. My list? More ethereal, indistinct, blurry, partly-in-focus, partly-mysterious shots… the kind I often bypass because they can be a little trickier to plan/take (or so it seems). I’ve not given this much thought. I play with a ‘daily’ bucket list of sorts, but not an on-going one. Now, I’ll give it some serious consideration! As for ‘what would the neighbors think’, if they are anything like my neighbors…they would be only mildly curious, “wonder what she’s taking pictures of today”, wave and move on. Oh, and your Dewy Dragon is wonderful! Thank you, Maura, I’ll be interested to know if something comes to mind!